Ostia takes its name from Ostium, mouth of the river. It is here, in fact, that once the tiber ended its course before throwing into the Tyrrhenian Sea, once much closer. A flood that occurred in 1575, then, also changed the course of the river sacred to the Romans, which from that moment has curved to the north, shifting its course of about two kilometers. 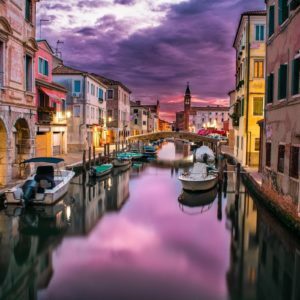 The legend traces the foundation of the city, the first colony of the Romans and the first river port in Italy, the fourth king of Rome, the Sabino Anco Marzio. However, the tradition is not supported by archaeological research, which revealed a fortified citadel, the castrum, dating back to the fourth century BC. Ostia was equipped with large walls by Sulla, to allow a greater and more flourishing development. 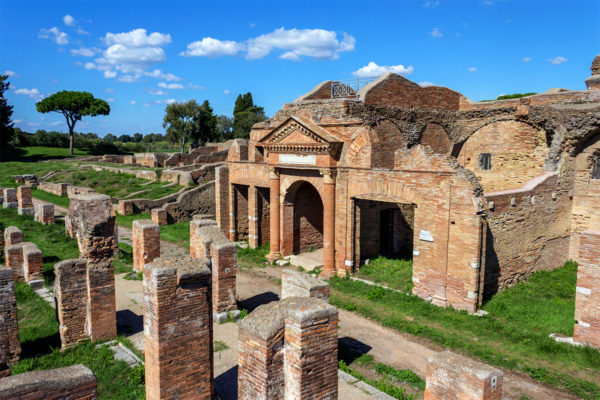 The real port of Ostia was the one built by Claudio, near the present international airport of Fiumicino, later enlarged by Traiano with the splendid hexagonal basin dug in the hinterland. 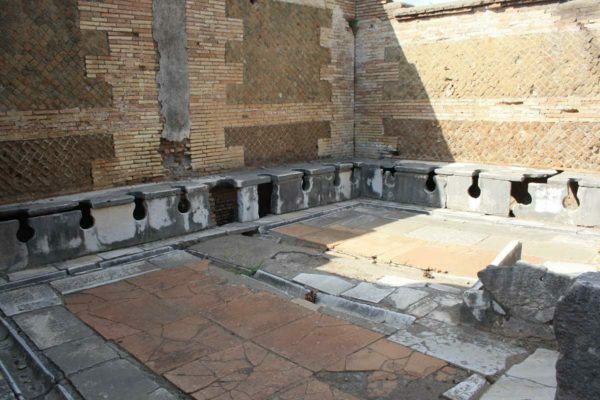 Ostia was therefore the center of sorting commercial goods directed to Rome, and the city grew in wealth and prestige, up to the climax with the urban restructuring of Hadrian, when it had more than 100,000 inhabitants. After the administrative autonomy granted by Constantine, Ostia begins its decline, parallel to the ruin of Rome, suffers the raids of the Visigoths of Alaric and after a momentary awakening under the reign of Theodoric, the negative fortunes of Rome and the barbarian incursions led to his abandonment. Our driver guise will pick you up at your address at the time the better you prefer with our luxury minivan. As you know we arrange only tour for small groups with a maximum of passengers of eight. 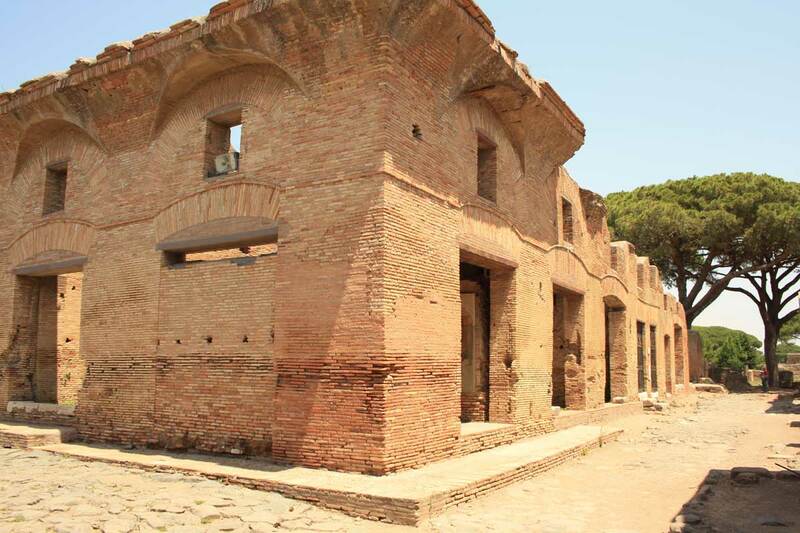 Ostia antica gives the opportunity to be visited even before the departure back to your country because is located only few miles from the Intercontinental Airport of Fiumicino. 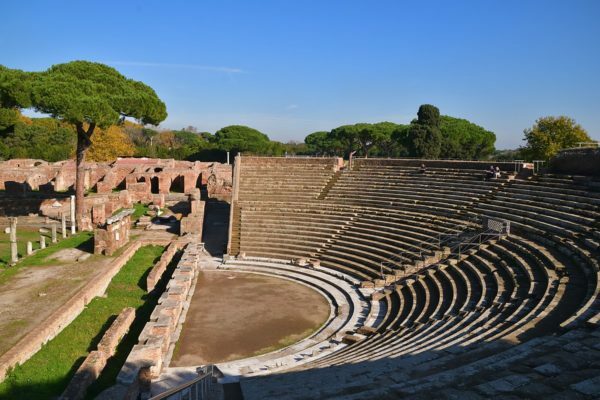 The Roman theater, located inside the archaeological excavations of Ostia Antica, offers an extremely suggestive atmosphere, especially on summer evenings where theatrical performances, concerts, cabaret and so on and so on are often organized. A definite place to visit. Its construction is originally from the age of Augustus, an inscription attributes it to Agrippa (died 12 a.c.), son-in-law and powerful minister of the emperor. It is therefore a very old building, which together with the back of Piazzale delle Corporazioni, formed a grandiose complex. At the end of the second century, Commodus had the theater rebuilt to a capacity of 4,000 spectators, from as many as 3,000 already. Then there were other restorations over time that further altered the structure. The current elevation of the building towards the street is due to the consistent general restoration that took place in recent times, in 1927. Four of the twenty-one arcades of the brick portico were also completely rebuilt, which had to be of two orders. Only at the far end of the outer ring of the portico can one still see some remnants of the tufaceous pillars in the square work of the original Augustan theater. Opposite the entrance to the excavations, in the suburb of the Roman Ostia, an area characterized by cultural testimonies extends from the classical period up to the modern era and in which the Borgo and the Rocca are inserted. Between 1483 and 1487 during the pontificate of Sixtus IV, Cardinal Giuliano della Rovere (future Pope Julius II) financed the construction of the Castle by entrusting the works to the Florentine architect Baccio Pontelli (registration on the portal to access the courtyard). The architectural complex consists of a perimeter system of casamates (gun rooms), which connect three towers, the main of which incorporates the previous tower desired by Pope Martin V, a ravelin and a large surrounding ditch, qualifies as an example of Renaissance military architecture. 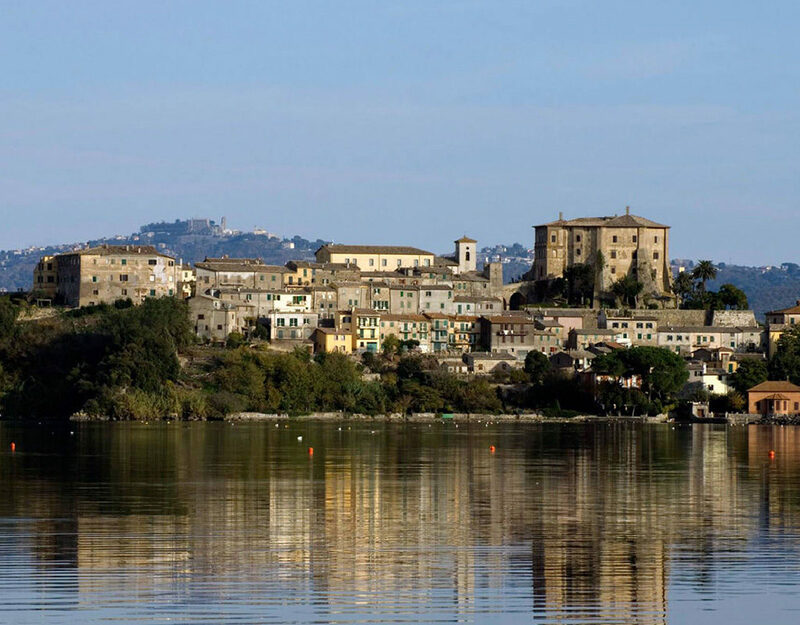 The trend of the Tiber, which is decisive for the settlement of the village, conditions, together with the latter, the triangular plan of the fortress whose primary function is to control the defense of the river. 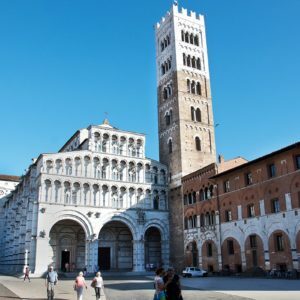 The strategic-military value, is partially attenuated, in the following years, by the construction of residential areas on the western side of the courtyard and by the staircase, attributable, as indicated by the inscription on the portal a, Julius II (1503-1513). The new monumental staircase, divided into three flights, presents vaults and walls decorated with polychrome frescoes (myth of Hercules) executed by artists from the school of Baldassarre Peruzzi. 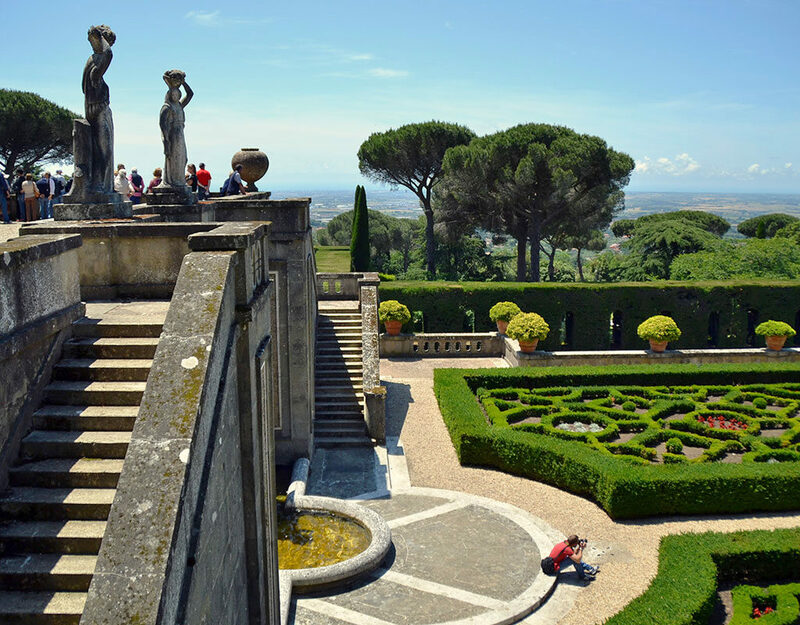 Ercolano is located in the center of the beautiful Gulf of Naples, in the Campania region. 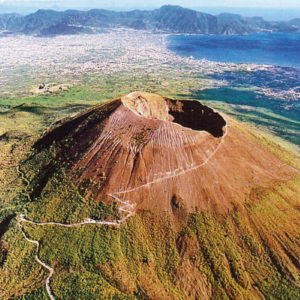 The city extends from the sea to the summit of Mount Vesuvius, a volcano still active today.